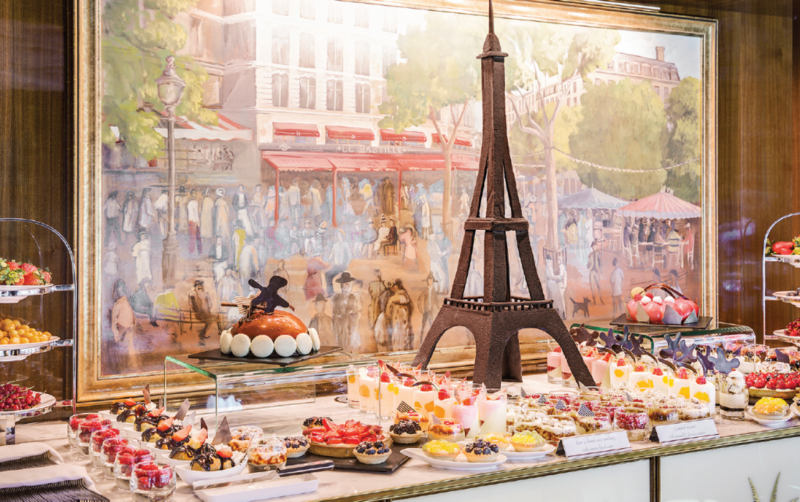 Cruise the Seine with Uniworld’s Joie de Vivre and you don’t just enjoy the finest French cuisine – you learn to create it, too. As ten of us gather in Cave du Vin, things look very promising. The walls are lined with bottles of fine wine, an array of fresh produce is spread across the large dining table, and I’ve just been handed a welcoming glass of Champagne. However, at every place setting there are two additional items: a very professional-looking chef’s hat, and an apron. The reason? While our follow passengers head to Joie de Vivre’s main restaurant, Le Pigalle, we’re going to be singing for our supper – albeit in the nicest possible way. Uniworld’s newest ship, launched in March to sail between Paris and Normandy, has been designed as a celebration of the French way of life. For me – and I suspect I’m not alone – that means wonderful food and wine, and plenty of it. 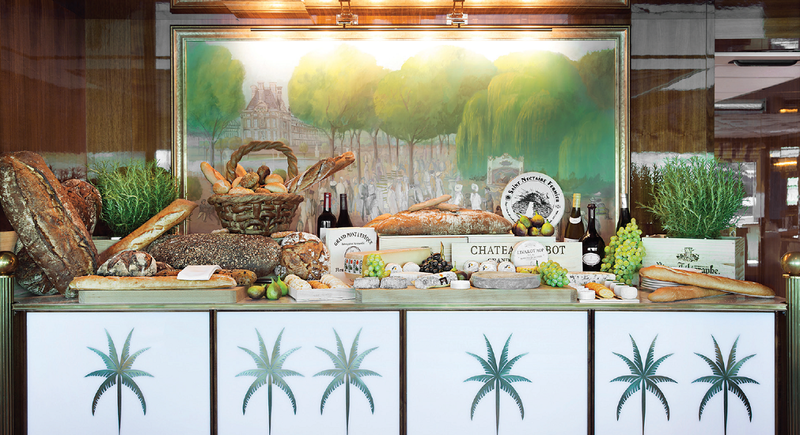 With Impressionist paintings and hand-made patisserie, could this ship be anything but French? 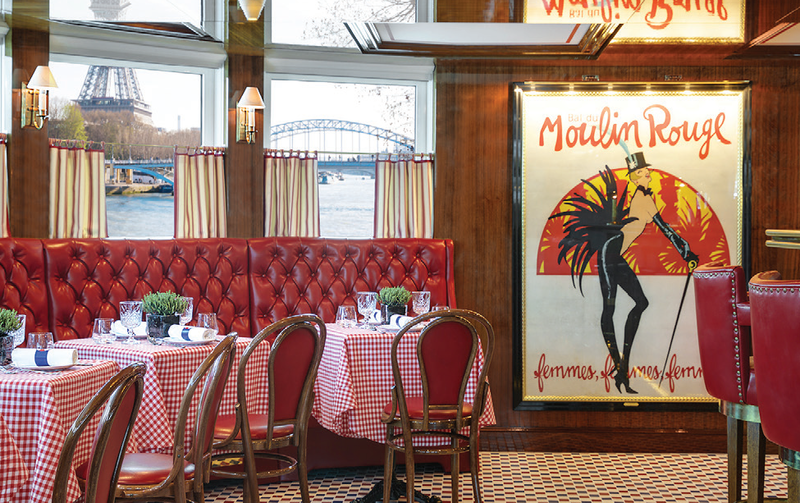 Joie de Vivre’s guests certainly won’t be disappointed on that score: the ship offers no fewer than five different dining options – unprecedented for a river vessel – including 24-hour room service if you’re still feeling peckish. Cave du Vin is a demonstration kitchen and private dining room – another first for the fleet – and is presided over by Dutch chef de partie Robbert Westendorp. After assessing his raw ingredients – in other words us rookie cooks – Robbert assigns various culinary tasks to the team. Obediently we start peeling apples, slicing gherkins, piping filling into a flan dish, stirring simmering saucepans and (glad I didn’t get this job) cutting potato gratin into perfectly equal triangles. It all turns out to be enormous fun, and well worth the 95 euros it costs to take part. No previous culinary skills are necessary, and all you need to bring to the party is a love of food. The result of our efforts is an extremely tasty fish soup followed by chicken liver pâté, slow-roasted beef with Foyot sauce (a variation on the classic Béarnaise), Normandy apple tart and array of French cheeses. We toast our culinary achievement with more Champagne before sitting down to polish off the fruits of our labours, with superb wines chosen to complement each course. The roots of Uniworld’s enviable reputation for superb cuisine can be traced to Bea Tollman, co-founder of the family-run sister brand Red Carnation Hotels. As a young wife running her first hotel with her husband, Bea started cooking even though she had no professional experience. As the business prospered and expanded across the world, Bea collected recipes from her travels, refining and personalising them to serve to her family. Her accumulated culinary wisdom can be found her book, A Life In Food, and one of her recipes is featured daily on Joie de Vivre’s lunchtime buffet. 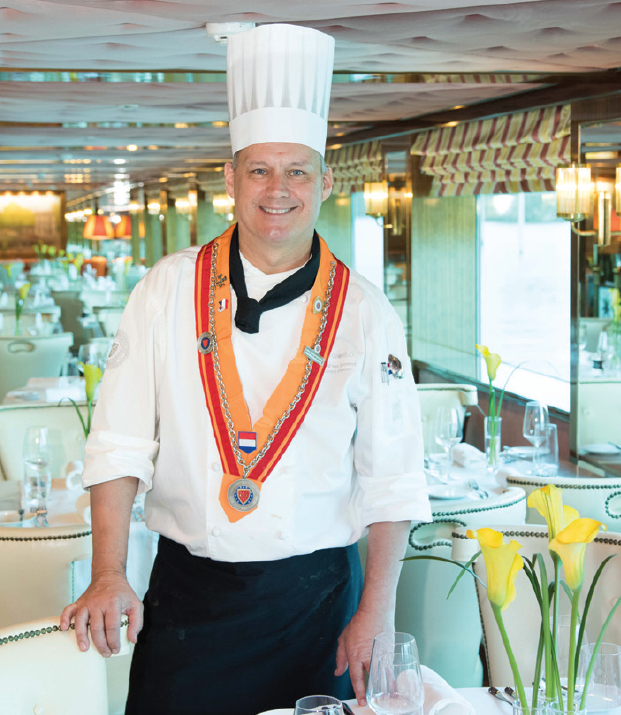 The man behind the ship’s menus is Uniworld Culinary Director Gerard van Helvoort, who began the planning process a full year before the new vessel’s launch. To ensure that all Joie de Vivre’s culinary offerings have an authentically Gallic accent, the 13-strong kitchen team is led by French executive chef Frederic Roland. As far as the dining venues are concerned, Le Pigalle is the place for the main buffet breakfast and lunch, along with the waiter-served evening meal. Upholding the French tradition of leisurely eating, diners can turn up at any time from 7pm to 9.30pm, which is unusual for river cruises. Indeed, take a seat in the charming Le Bistrot at the front of the ship, and you could be in a Parisian street café (minus the cigarette smoke). Tables are adorned with red-and-white checked cloths; waiters wear long starched aprons, and the menu features cheese-topped onion soup, steak au poivre, Toulouse cassoulet and a rather more professional version of the apple tart we made at Cave du Vin. At the opposite end of the vessel is Club L’Esprit, where the indoor pool magically changes into Claude’s Supper Club and live music venue at night, with the help of a nifty hydraulic floor. The menu showcases dishes for sharing, such as baked Camembert, duck cassoulet and vegetable gratin. And if any British guests find themselves yearning for a taste of home, everything stops for afternoon tea in the Salon Toulouse lounge and bar, where waiters serve cake stands laden with sandwiches, scones and sweet treats against a tinkling backdrop of live piano. Many of Joie’s shore excursions have a culinary theme, including the chance to visit La Couronne, the Rouen restaurant where American chef Julia Child first fell in love with French cuisine. Passengers can enjoy a recreation of the lunch she described as the “most exciting meal of my life”, starting with half a dozen oysters followed by Dover sole, green salad and cheese. in a fabulous floating restaurant, your correspondent could probably do with a little corsetry herself. But when in France it’s always best to go with the flow. Bon Appetit! Joie de Vivre’s seven-night Paris & Normandy cruise costs from £2,489pp, based on two people sharing a cabin, including all on-board meals, wines with lunch and dinner, unlimited drinks throughout the day, daily excursions, flights, transfers and tips. Call 0808 168 9231 or visit www.uniworld.com.